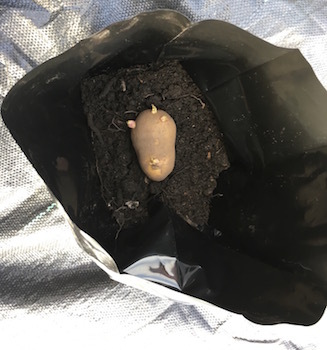 One seed potato - one grow-bag, but who can grow the most? The basic idea is very simple. 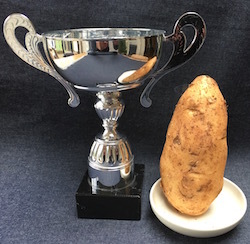 Competitors pay a fixed amount to receive one seed potato and one potato gro-sack or plastic pot. Everyone takes these home adds some soil or compost to the bag and plants their seed potato. 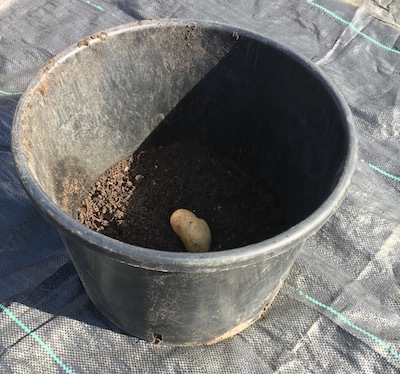 As the potato begins to grow they add soil / compost untill the bag is full. The bags are tipped out and prizes awarded to the best growers. Both of these are available from garden centres or online. New potatoes are generally best - growing well in bags and producing big crops. The potato grow sacks come in all shapes and sizes from quite minimal as in this picture to robust large bags that will last a few years growing. You cannot use anything to flimsy such as black bin liners as these would simply not be robust enough. Whether sacks or pots the important thing for a fair competition is that everyone need to be using the same size. The compost or earth is down to the individual. Some competitors (you know the type!) have been known to put together special grow fast compost mixes etc - that is half the fun. On the day of the Grand Reveal everyone brings their sack or pot to one location. In turn, with as much ceremony and fanfare as you can muster they are turned out and the crop of fresh potatoes revealed. 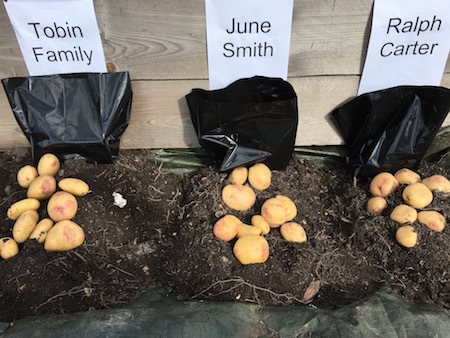 Another way of running this competition is to plant the potatoes straight into the ground in a long row, This is ideal in the schoolyard where pupils can plant into the ground and add an identifying stick with their name on. You should charge competitors a fixed amount or suggested donation for their seed potato and sack. That money will realistically only cover costs. 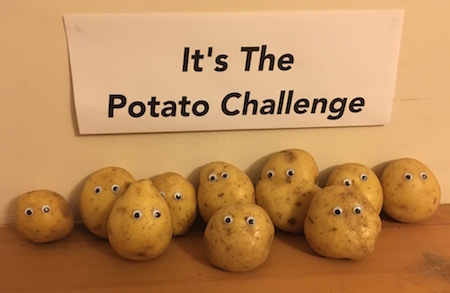 The potato challenge however provides an opportunity to undertake lots of other activities. It might form for instance an integral part of a school fair or church fete. Or you could organise an entire afternoon Spudfest with a whole range of potato themned activities.